Every now and then we can to print for some really big names! It is humbling and it is fun. 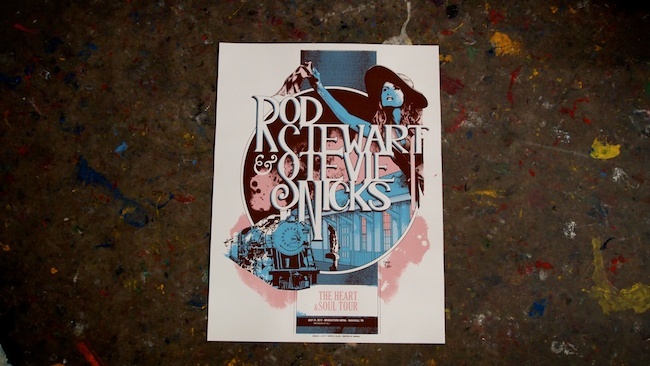 This is a really neat print for Rod Stewart and Stevie Nicks for their 'Heart and Soul' 2012 tour. It is a masterful 3-color print screened on 19"X25" white French Paper cover stock. It was designed by T-Bone and Aljax and was a tiny edition of 50 limited edition prints as a gift for the band. The poster is for their performance at the Bridgestone Arena in Nashville, TV on July 24, 2012. A very small handful of artist prints are available here from ABNRML.com.